“Being the market leader in 3 years” is the challenge to meet. The leader of a small healthcare company, product of a recent carve-out, wanted to give an identity to the new structure and to federate the team around an ambitious project: becoming the world leader on the market within 3 years. The Appreciative Inquiry method was selected. A 2-day off-site seminar during which the twelve team members participated took place followed by a workshop 6 months later. From the 24 interviews, 8 projects supporting the envisaged future were implemented further to the 24 interviews and the various works carried out during the change initiative. 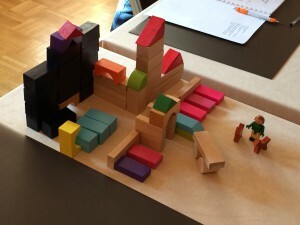 Example of a group work from the seminar: The stimulating future is represented by a construction, which symbolizes every key-element of the shared vision. The team in a previous specific group work has identified this vision.